Not often thought of today, my 2nd great grandfather Michael Lowry was still alive in 1940. In fact, he lived to see his grandson Charles graduate from Ursuline High School, depart for France with the Army and be wounded in the fight for Brest, France. He died in Mayhew Nursing Home in Perry Township, Columbiana County, Ohio in 1949. In 1940, Michael was 71 years old living with his wife Annie in Salem, Ohio. Lowry, Michael, head, male, white, 70 years old, married. Has not attended school or college since Mar 1, 1940. Completed education through 8th grade. Born in Pennsylvania. Lived in the same house on April 1, 1935. Does not live on a farm. Was not at work for pay the week of Mar 24 – 30, 1940. Was not performing emergency work (CCA, WPA, etc) the week of Mar 24 – 30, 1940. Is not seeking work. Did not have a job or business. Is unable to work. Occupation is a coal miner in a coal mine. Number of weeks worked in 1939: 0. Income received: 0. Receives income greater than $50 or more from sources other than money wages or salary. ” Annie (X.) wife, female, white, 70 years old, married. Has not attended school or college since Mar 1, 1940. Completed education through 6th grade. Born in Germany. Lived in the same house on April 1, 1935. Does not live on a farm. Was not at work for pay the week of Mar 24 – 30, 1940. Was not performing emergency work (CCA, WPA, etc) the week of Mar 24 – 30, 1940. Is not seeking work. Did not have a job or business. Is engaged in home housework. Number of weeks worked in 1939: 0. Income received: 0. Receives income greater than $50 or more from sources other than money wages or salary. It is interesting that the enumerator listed the occupation of coal miner for Mike. The instructions say to only list occupation for those who work, and Mike does not work in 1940. Michael and Annie have income other than a salary coming in, so perhaps Michael earned a pension for his work as a coal miner. The X. next to Annie is written on the census form and indicates that she answered the enumerator’s questions. 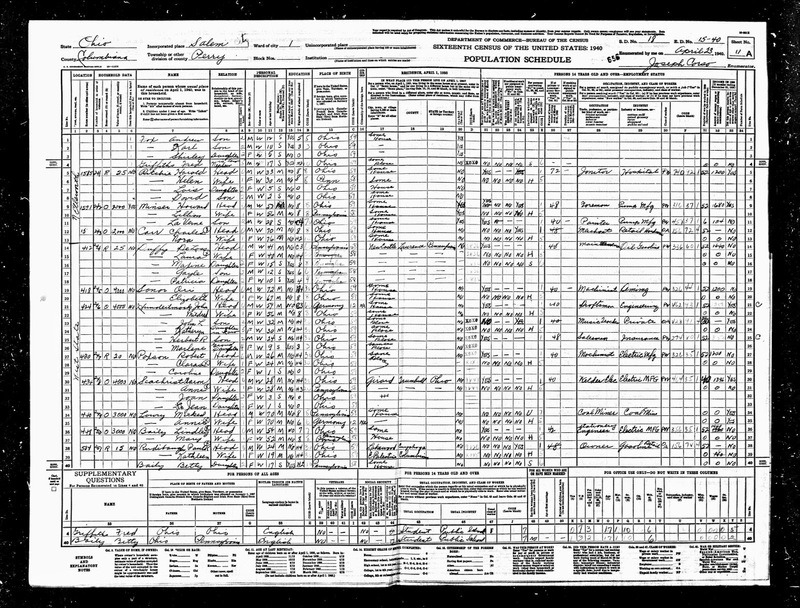 1940 U.S. Federal Census, Columbiana County, Salem, population schedule, Enumeration District 15-40, Sheet 11A, Dwelling 249,. Michael Lowry; digital image, Ancestry.com (http://www.ancestry.com : accessed 10 December 2013), citing National Archives microfilm publication Roll T627_3267.